Increasing numbers of vehicles are using automatic stop-start systems, to help lower emissions and fuel consumption, but these can put enormous strain on the battery. The new OptiMate 5 START-STOP battery optimizer is designed to provide completely safe charging and maintenance for the 12V EFB and AGM batteries fitted to modern cars & vans. Stop-start vehicles are equipped with the latest EFB (Enhanced Flooded Batteries), which are more powerful and durable than standard flooded / wet cell batteries. However, regular use – especially in heavy traffic and in busy urban situations – puts the battery under enormous pressure. A vehicle with stop-start can be expected to go through over 500,000 stop-start cycles over its lifetime, compared to the 50,000 cycles a traditional vehicle will perform. A long-term care routine is essential to keep battery performance at its optimum, to avoid failure of the battery during a high-pressure situation, (at traffic lights or a junction, for example) and to help ensure a long working life of the battery. 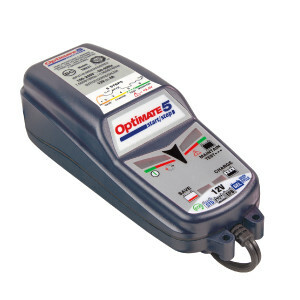 The OptiMate 5 START-STOP is specifically adapted for batteries used in stop-start systems, delivers 4 Amps for a rapid recharge and is programmed not to exceed 15 volts while charging. This is because the increasing sophistication of modern systems means high voltage charging (typically anything over 15 -16V Volts) can damage the sensitive stop-start circuits. Designed to ‘connect and forget’ the OptiMate 5 START-STOP is fully automatic, so no input from the user is required. There is no risk of over-charging, plus spark suppression and automatic shutdown if short-circuited or the battery is disconnected. Safe to use with all EFB, AGM, STD and GEL 12V batteries from 15 – 192 Ah, the OptiMate 5 START-STOP can also ‘save’ deep discharged batteries with as little as 2 volts remaining. It can diagnose then repair, charge and maintain the battery, automatically. Safe to use indoors and outside (down to as low a -4°F / -20°C), with a tough weatherproof case and waterproof leads/connections, The OptiMate 5 can also be wall-mounted and like all OptiMate optimizers, is covered by a three-year limited replacement warranty for complete peace of mind.